I have learned that I can handle just about anything if, and only if, I have a stable base on which to stand. And I’ve learned that the elements that build that base, for me, are Sunlight, Activity,and Rest, in that order. Rest alone doesn’t do it. It seems like it might, but it doesn’t. A string of dark rainy days, followed by sunny days only when I was inside, working, left me with no reserves at all. Every little thing seemed insurmountable and the big things seems downright daunting. 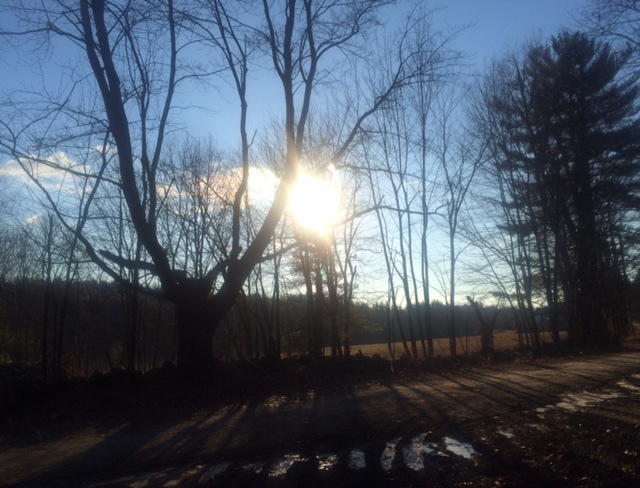 Then I got outside again, popping in and out of shops in a corny Vermont town with Steve, and then back walking up and down hills in the woods with Gale, all in the bright winter sun. Suddenly nothing is that hard any more and everything seems hopeful. So for the rest of this winter, with our way-too-short days, I’ll be outside gathering whatever daylight I can grab, building the solid base that I need. Previous Previous post: Lessons are Everywhere! Next Next post: Check In Already!